Disclaimer: I received a Buff UV Half Buff as part of being a BibRave Pro. Learn more about becoming a BibRave Pro (ambassador) and check out BibRave.com to review, find, and write race reviews! Often imitated, but nothing like the original, this buff is more than half full. If you're not familiar with BuffUSA, Original BUFF® headwear is the product that started the multi-functional headwear revolution. At its core is a moisture-managing microfiber fabric that is wind resistant and able to control odor. I am already a proud owner of a Buff Original BUFF® headwear. The Original BUFF® headwear can be worn more than 12 different ways from a cap to a balaclava to a hair tie, for a personalized style and perfect fit. The original BUFF® headwear is made of a light-weight odor resistant fabric that can protect you from the harshest elements; sun, wind, rain, and cold. The HalfBuff is "cut from the same cloth" literally, but has less fabric lending itself to the hotter months. The "inverse" is also true as they have a Merino version worthy of the coldest runs you might have when winter rolls back around. 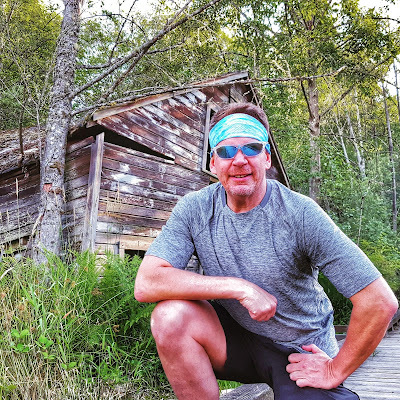 Being a survivor of skin cancer myself, I'm particularly cautious about what I wear when I'm headed outdoors for a run and equally careful about what products I use. I ALWAYS have something to help cover the head and Buff's UV protection is an added bonus in terms of protection. Coming off a fractured foot, my outdoor runs have been limited of late, but I've spent the last month doing a lot of cross-training in the gym and like the HalfBuff for those workouts in "headband mode" providing help with the sweat. I'm a profuse sweater...as in I have "cartoon-like" sweat. With several hot weeks left as I commence marathon training again (gulp...wish me luck, rub your rabbit's foot for me,) I will get a lot of use out of my HalfBuff. One of my fellow BibRavePro's turned me onto a great idea and that is soaking it in water and freezing it the night before a really hot run. She wore hers around her neck and it was a great way to keep the "engine cool" on the run. Want one of your own? Join us on Twitter, Tuesday night July 19th at 9:00PM EST for #bibchat. Follow @bibrave on Twitter for all of this weeks questions. Also follow @buff_usa to be eligible to win.